How to go from Incheon Airport to Hongdae (Hongik University Street) by Bus? Most young travellers to Seoul like to stay in Hongdae. Fortunately, getting from Incheon Airport to Hongdae is easy. All you need to do is to hop on Bus 6002 at Incheon Airport Bus Stop 5B or 11B on 1st Floor, Millenium Hall (Terminal 1). You can also take bus 6002 from the new Terminal 2 of Incheon International Airport at 1 basement floor Number 29. Where to get off Bus 6002 for Hongdae? Get off bus 6002 at Hongik University Station for Hongdae. 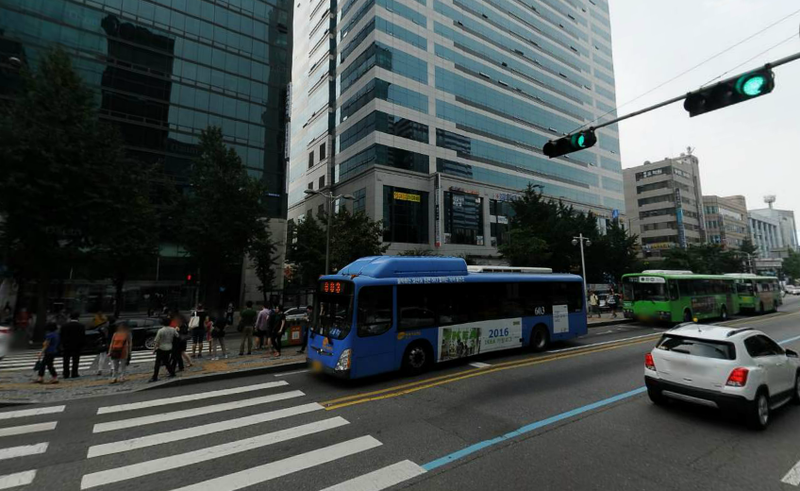 It is located near EXIT 2 and EXIT 8 of Seoul Subway Line 2's Hongik University Station. This area is known as Hongdae. A one way trip for shuttle bus 6002 from Incheon Airport to Hongdae costs Korea Won 10,000. This price is quite reasonable compared to taxi which costs at least five times more. You can purchase the ticket at Limousine Bus ticket booth at arrival hall of Incheon Airport or pay by using T-Money card if you have got one or bought it at Incheon Airport. The bus trip from Incheon to Hongdae takes less than 50 minutes. Hongik University Station where you should alight the bus is only the third bus stop from Incheon for bus 6002. After stopping at Hongik University Station for those going to Hongdae, this bus from Incheon Airport will continue its trip towards Cheongnyangni Station. Along the way, shuttle bus 6002 will also stops at Sichon Station, Jongno 1-ga, Jongno 2-ga, Jongno 3-ga, Jongno 4-ga, Jongno 5-ga, Jongno 6-ga, Dongmyo Station, University of Seoul Station, Dongdaemun-gu Office, Sinseol-dong Station,Seoul Folk Flea Market. Therefore, apart from those going to Hongdae, those who are going to these destination can also take bus 6002. It is very convenient to take bus 6002 at Incheon Airport because there is a bus departure every 15 minutes. You don't have to worry about missing the bus. The first bus from Incheon Airport for Bus 6002 to Hongdae will depart at 5:30am from Incheon Airport. The airport shuttle bus will continue to operate at the frequency of about every 15 minutes until 11:30pm near mid night to bring passenger from Incheon Airport to Hongdae. 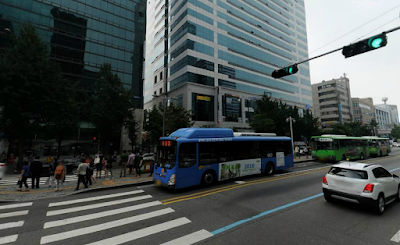 There are many hotels in Hongdae area near Hongik University Station or Hongik University gate for that matter. In fact hotels and guesthouses here are quite cheap and affordable compared to prime areas in Seoul City Center such as Myeongdong. If you staying at Hongdae Housetay Guesthouse 2, Hongik University Street, K-Guesthouse Sinchon 1, Kimchee Sinchon Guesthouse, Orange Guesthouse Hongdae or Shinchon Y Hotel, you could take Shuttle bus 6002 from Incheon Airport to go to Hongdae and alight the bus at Hongik University Station. Apart from taking bus 6002 from Incheon Airport, you can also take the All-Stop-Train from Incheon Airport to get to Hongik University Station. DO NOT TAKE AREX from Incheon as it will NOT stop at Hongik University Station. The All-Stop-Train from Incheon to Hongik University Station is only KRW4,050, which is cheaper compared to bus from Incheon Airport to Hongdae. Hi! How about the luggage if we take the bus? There are space for you to store luggage on the bus. If you have large luggage, you can also store it under the trunk of the bus. The bus driver will open it to retrieve your luggage when you arrive at your destination. Hi, can you help us on the best way to go to hongdae if we arrive at incheon near or past midnight? we are worried that it will take us long to finish the immigration process and we cannot catch the last airport bus. For the large luggage, before departing the bus, the driver will assist us also right? Or we should advise the counter upon buying of bus ticket? Yes. The bus driver will help. Don have to worry. i want to go to inchon airport. i've two large luggage. is it ok under the trunk of the bus? to incheon..can i know where is the bus stop..thank you in advance..
Wow, thanks for the quick important information that i did not now. At least you saved the hustels of getting stranded. Thank you so much once more.